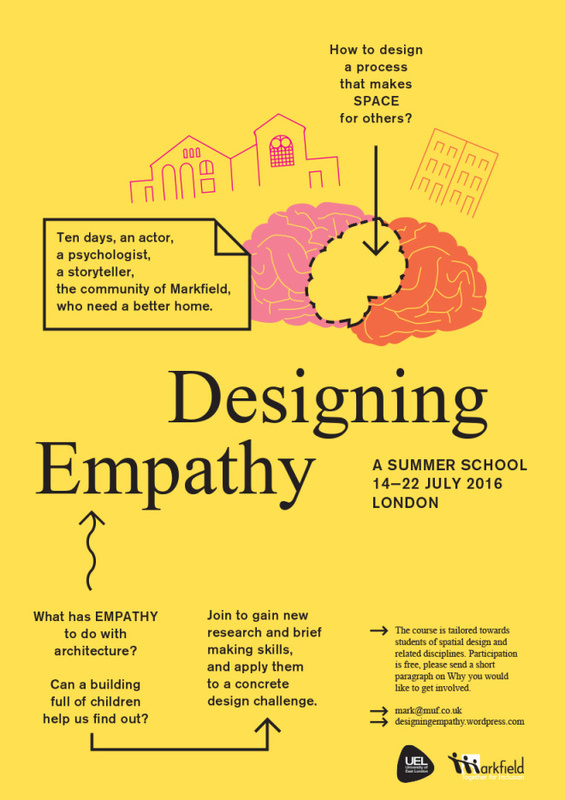 What has empathy got to do with architecture? Can a room full of children help us find out? Or maybe an actor, a psychologist, a meditation teacher, and a storyteller? How to design a process that makes space for others? Gain new research and brief making skills, and apply them to a concrete design. Chantelle and Harriet joined with Mark Lemanski from Muf Architecture/Art to work with students as part of a 10 day workshop at the Markfield Project in Tottenham. The workshop provided the opportunity to enter the minds of visitors and staff of the Markfield Project, to practice and develop participatory strategies, and to establish design principles for the future development of the Markfield building. The site of this research is the inextricable evolution of programme and building at Markfields, a charity providing an inclusive place for children of all abilities to play, which will provide a rich mine into an understanding of the architect’s role as an operator on the interface of people and place. Newer Post Dekka join design team for Ealing Broadway Crossrail Station. Older Post Dekka appointed to develop lighting strategy for Nightingale Estate, Hackney.